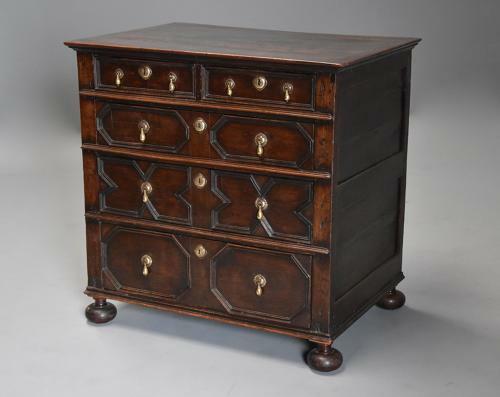 This chest of drawers consists of a four plank top with moulded edge leading down to four graduated drawers with applied geometric moulded designs to the front, this being a popular design at the time. The metalwork, ie. handles and escutcheon plates are designs in keeping with the piece but have been replaced at some point over the years. The sides and back are panelled with a moulding to the base leading down to four bun feet which have been replaced due to rot but copied from the original. This chest of drawers is in very good condition for age, it is of stable construction and can go straight into a home.